As a corporate strategist, you have the fortunate chance to ride disruptive trends and to cross-pollinate lessons and best practices across a vast array of sectors and organizations. So, when this whole notion of 21st-century education hit my radar two years ago, I could not stop imagining amazing things happening if this vital sector was willing to hit the high notes others did. It turned out the more I dug, the more I realized education can be quite a stubborn beast. Even to the point of considering outsiders as if they were barbarians at the gate. To a certain extent, it is understandable. Education is a secular world with a long-standing tradition of independence that has served us well in the past. Meanwhile, outsiders, especially ICT business people, have made quite a bad reputation for themselves in the way they have intervened in education affairs, during the last decade or so. On many occasions, their know-it-all-been-because-I’m-rich-and-successful attitude has proven quite condescending to teachers and education managers. Their self-interests and their predisposed myopic proclivity toward edtech and for-profits business ventures have not helped either. That said, it is one thing to give dues and manage susceptibilities, it’s another to issue a clean bill of health to education while ignoring the elephant in the room. The fact of the matter is, whether we want it or not, education is heading for disruption. And, for the sake of everyone, I think it would be terribly unwise not to have all hands on deck. That includes letting newcomers, free thinkers, start-ups, bankers, even outcasts and education hackers do what they do best. Why the need for fresh blood and the sense of urgency? The simple answer is this. As it stands, the wealth of education is quite evenly distributed. Each nation, having the learning grid they can afford, most of it being owned and managed at the national level. Now, contrary to what many believe, 21st-century education will not be about gizmos, flipped classrooms, MOOCS, big data, adaptive learning, and similar epiphenomenons. Nor will it be about funding and making marginal improvements to the current organizational models. All that, while managing the usual give and take amongst major stakeholders and not ruffling too many feathers. First and foremost, the primary aspect of this upcoming disruption will be the globalization of the learning landscape. And for those who don’t elevate their game to that level, we believe there will be a high price to pay in terms of lost opportunities, job losses, and foreign ownership. And let’s not forget the negative impact any sub-par national learning grid will have on the ability of its people and their organizations to deal with an increasingly complex and competitive global economy. For those who can read a thousand words per image, figure 1 tells the story of this upcoming disruption. The inner box (red/yellow portion) shows education is now dealing with what I consider a three-body problem without a continuity solution. As I will explain in upcoming posts, both the content-side, as well as the network-side are, in my opinion, antiquated and in need of revamping, to say the least. They are held down by down by academic provisioning, failing economics and organizational models treading toward obsolescence. As for the current state of governance, I’ll be equally blunt. In my opinion, this stakeholder logic/apparatus is not particularly well suited to engage freely and openly in rethinking education. With so much vested interests at stake, and all the wheeling and dealing it requires, one can hardly imagine how this could objectively lead to the kind of break-free vision we need in a time of disruption. At the risk of sounding provocative, one should have the right to ask the question, whether institutional and nation-wide governance models are conducive to the type of leadership and the kind of restructuring we need altogether. In contrast, the outer box – highlighted in vivid green – represents the kind of triple-play action we think is necessary to bring education to the next level. Final comment. We think it is imperative to take a long hard look at the current model of academic content creation and provisioning. We also believe open content and real learning is the first set of keys to unlock the real value of 21st-century education. 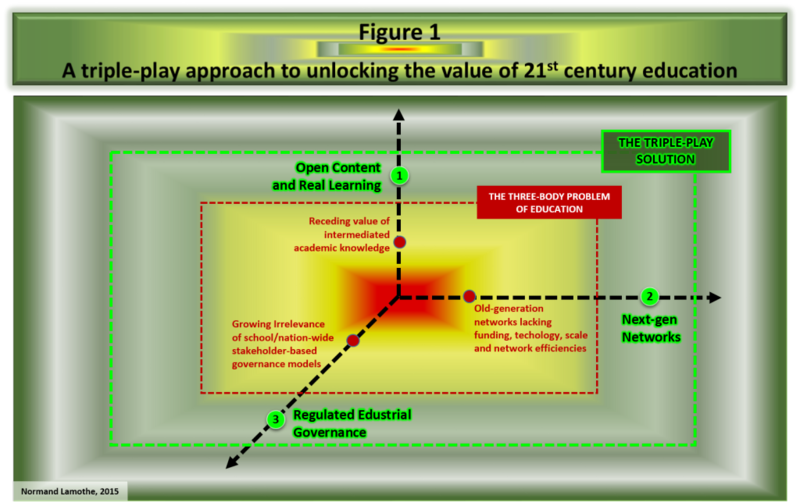 Yet the overall strategy rests on addressing all segments of this triple-play approach.